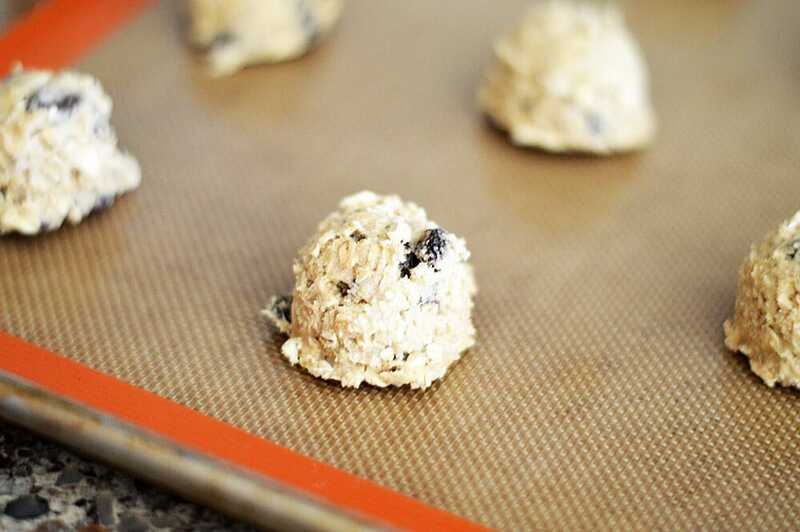 This recipe may not be groundbreaking or glamorous, but sometimes you just want Easy Vegan Oatmeal Raisin Cookies, and I am here to help you out! Everyone asks me how I get such uniform cookies…. I must admit, I cheat a little. It’s all due to this set of cookie/ice cream/melon scoop-y things I found on Amazon. I use them for pretty much everything. I used the medium one today and with the bottom of a glass, sprayed occasionally with cooking spray, flattened the balls a bit so I’d get bigger, less puffy, cookies. I don’t know if you can see it here, but they are light, airy … almost lacy. They are soft and chewy with just barely crisp edges. I allow them to cool on the cookie sheet to firm up just enough to transfer to a rack where I allow them to cool completely. Or semi-completely if you are familiar with my obsession for right-out-of the-oven cookies 😉 Patience was never my thing. Enjoy with a cold glass of your favorite non-dairy milk. Dunk if you must. This recipe made about 22-24 cookies, but you could always make them smaller if you prefer. 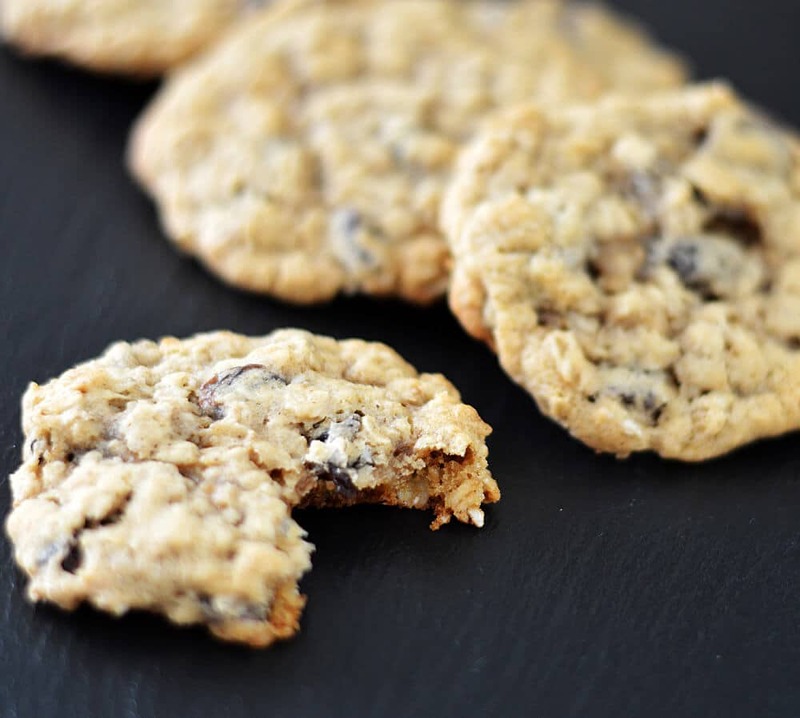 Did you make this recipe for Easy Vegan Oatmeal Raisin Cookies? If so, leave me a comment below and let me know what you thought. Bring the vegan margarine to room temperature. In the bowl of an electric mixer (or you can mix by hand), add the room temperature margarine, sugar and brown sugar. Beat for a few minutes to allow the sugar to dissolve a bit. Add the flour, salt, baking soda, cinnamon, applesauce (OR flax mixture if using instead of applesauce) and vanilla. Beat until incorporated. Add the oats and raisins and beat just a few times to distribute them, or you can fold them in by hand. 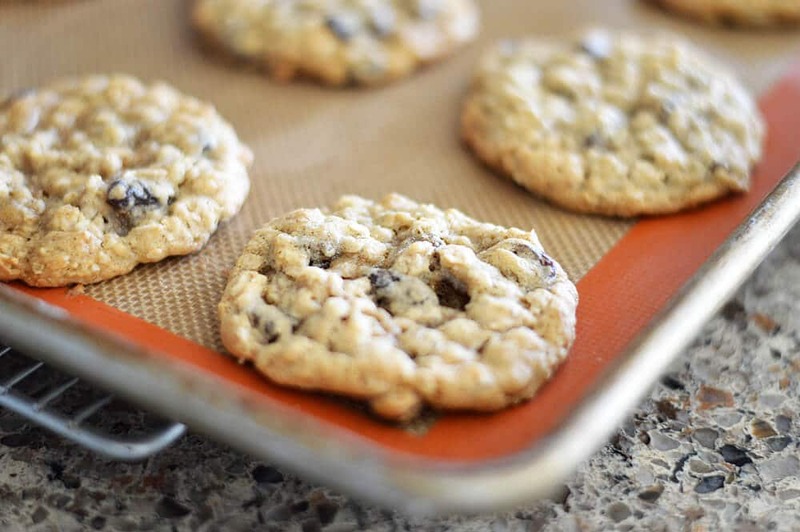 Use a small scoop, portion the cookie dough onto either parchment or a silicone baking mat. Using the bottom of a glass sprayed with cooking spray, flatten the dough a bit. This will produce a more uniform cookie. You may need to spray the glass occasionally to avoid sticking. Bake for 7-8 minutes or until just golden on the edges. Allow to cool on the cookie sheet until they firm up and then transfer to a wire rack to cool completely. Absolutely delicious!! Soft and chewy, incredible good. It took 9 min in my oven, they are perfect. Can you substitute the sugar with maple syrup? Hi Leora, I wanted to say yes but looking at the overall measurements – it would just be too much liquid. I fear the structure of the cookie would be really compromised. You could try incorporating all of the rest of the ingredients and THEN adding maple syrup taking care to stop before it loses that “cookie batter” texture. I would love to hear how this turns out for you if you try it. Made these today and they came out great. I used a tbsp to drop rounds of the mixture and got 30 cookies. My oven is old and needed a couple extra minutes to brown, but they still came out exactly as described soft, chewy but with crispy edges. Yum! Thanks for sharing! Just to clarify, should all of the vegan butter be brought to room temperature, or just “1/2” per instruction 1? I wasn’t sure if you had intended to say “1/2 cup” or if you were instructing to set aside the other half for later use. Thanks! Substitute the raisins, with vegan Chocolate chips. Super yummy! Also, add walnuts if u like them/can eat them. 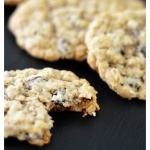 = Chocolate walnut oatmeal cookies. One could also add dried cranberries, or other things you like, to make them unique. These were AMAZINGLY delicious!! I made some for my co-workers and they loved it! Mind you they’re not vegan. Love how quick and easy it is to make! Thank you for sharing. Yay! I love reading comments like this 🙂 Did you tell the co-workers they were vegan? Just curious lol Glad you enjoyed them! Aquafaba in place of the applesauce works great too. I am munching on the yummy results right now. Great recipe! Can I sub the margarine with oil? These turned out unreal!!! I used coconut oil instead of margarine and used dark chocolate instead of raisins. DELISH. Perfect texture… Can’t get enough of them. My non-vegan husband loves these. He actually hid these from the other cookies so he didn’t have to share them. I’m making him more today! Great recipe! I used a tablespoon to scoop out rounds and squished them down into ~2 inch cookies. I baked them for 11 minutes at 350F. They came out awesome! My dad ate 7 all in one sitting. Thanks a bunch! I’m so glad you (and your dad) enjoyed them 🙂 That makes my day! Just made these. Followed the recipe carefully though didn’t cream the butter and sugar very long, and left out raisins. Had to bake them a few minutes longer to get them to brown on the bottom but it may be my oven. They are good except they taste of soda. Can’t figure out why. The old non vegan recipe I used to make that was on the Quaker Oats box for years I believe had one cup of flour one tsp. of soda, and three cups of oats. I think it called for more sugar and fat. Would a mashed banana work instead of the applesauce. I just made these and they are amazing. I found them just a little too sweet so when I make them next time I will cut back on the sugar. I substituted cane sugar and coconut palm sugar for the sugar and brown sugar. I have to say they are probably the best oatmeal raisin cookies I have ever tasted. Thanks so much for the recipe! I use cranberries instead of raisins and add walnuts. I’ve made this recipe about 10 times now and I love it! So does my son who keeps eating them all. Just made these according to the recipe except that I added chopped walnuts. They’re great. I had to bake them 11 minutes instead of 7 or 8, but that may be due to the addition, the size of the cookies or the homemade vegan butter I used. They were worth the extra few minutes.